Your bill has been paid? 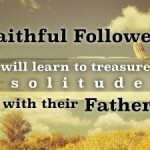 Faithful Followers will learn to treasure solitude in prayer with their heavenly Father. The question is, "Will it be the easy way or the hard way?" Follow Christ's example of prayer, focus on your relationship with God and learn how to pray well with others.